launch at-scale local campaigns via sponsorships. Want to sponsor PTAs in Pittsburg? How about 50 Labor Day Parades across the country? Need to network with lawyers? Searching for event marketing options in Chicago? 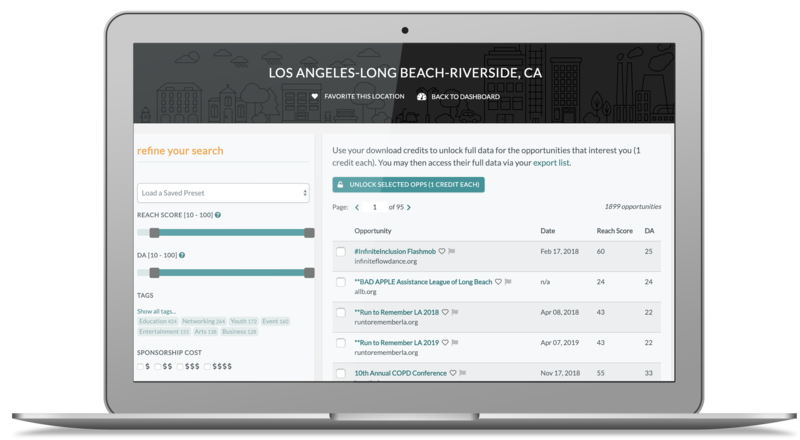 The ZipSprout Local Sponsorship Finder makes it quick and easy to find targeted sponsorship opportunities for your budget. Search by location, domain authority, sponsorship cost, topics of interest and more to find opportunities that best fit your outreach goals. Then, use our ZipSprout Reach Score™ to choose the opportunities with the best bang for your buck. The Local Sponsorship Finder is a new DIY offering from ZipSprout.com, our enterprise-level sponsorship matchmaking service. At our enterprise service, ZipSprout Matchmakers have placed over $951,000 worth of sponsorship dollars with over 2,100 opportunities since its launch in January 2016. This year, by popular request and to celebrate ZipSprout's 3rd birthday, we launched the Local Sponsorship Finder for smaller agencies & inquiries. Psst - if you're looking for a more full-service experience, or you're a nonprofit looking to get sponsored, please head over to our agency services here.